President Woodrow Wilson, seated at desk with his wife, Edith Bolling Galt, standing at his side. First posed picture after Mr. Wilson’s stroke partially paralyzed his left side, White House, June 1920. Mrs. Wilson holds a document steady while the President adds his signature. Not true: Conspiracy theorists love this one. True: Woodrow Wilson is the only President to earn a Doctor of Philosophy (Ph. D.). Two of Wilson’s daughters were married in the White House while he was President. President Wilson was the first President to host a press conference. His 1913 State of the Union Address was delivered live – he was the first President to do so since Thomas Jefferson discontinued the practice in 1801. Wilson is one of two Presidents to be widowed while in office (President Tyler was the other). 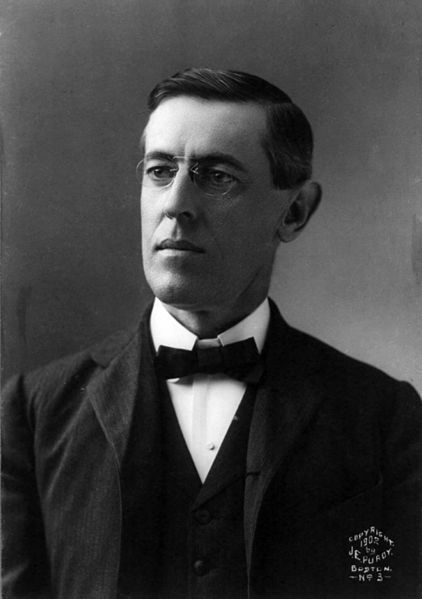 Wilson pushed the Espionage Act of 1917 and the Sedition Act of 1918 through Congress, effectively throttling anti-war or pro-German opinions. The US Post Office, following the instructions received from the Justice Department, refused to carry any materials deemed critical of the US war effort … 60 newspapers lost their 2nd class mailing rights, and were effectively banned from the US mail. Freedom of the Press? Not 100 years ago! Freedom of Speech? During the war, criticism of the Democratic Wilson administration became grounds for arrest and imprisonment. 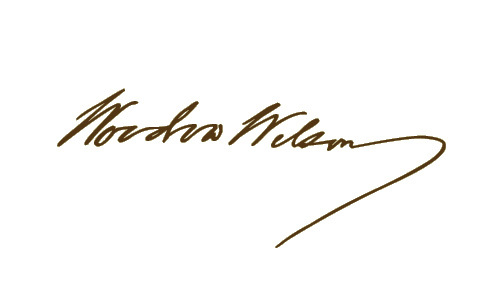 He was the first President to cross the Atlantic Ocean. President Wilson’s first wife, Ellen Axson, died in the White House during the summer of 1914. 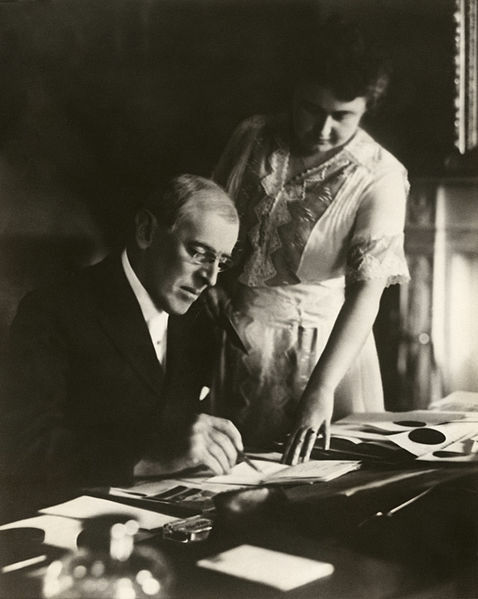 Wilson married again in December 1915, to Edith Bolling Galt After Wilson suffered a stroke while in office, Edith controlled access to the President, igniting a debate that still remains over how much power she exerted. In 1920, President Wilson was awarded the Nobel Peace Prize. He is the only President buried in Washington, DC. 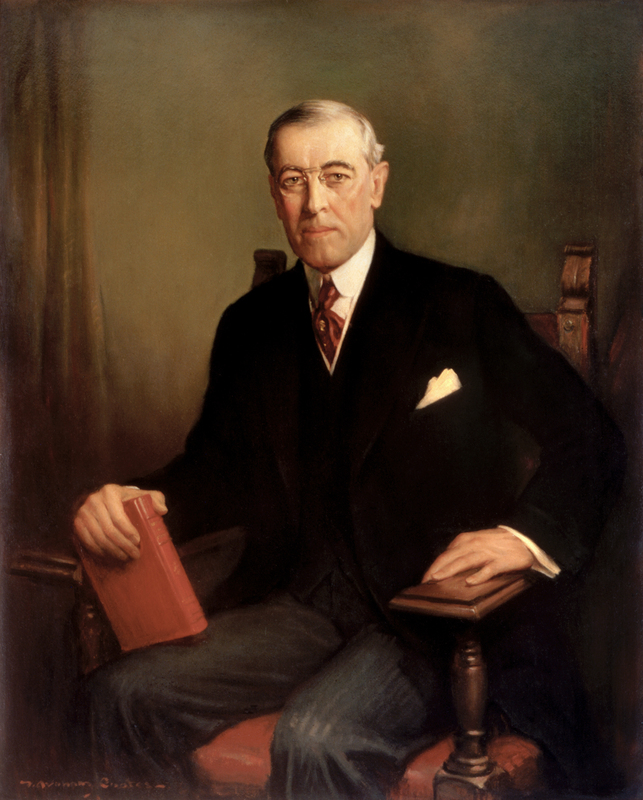 The Official Portrait: F Graham Cootes painted this 1936 portrait of Woodrow Wilson. The painting hangs above the Grand Staircase in the White House, along with portraits of other 20th century Presidents. It shows an academic President, with a book in hand.